Swim, windsurf, and sunbathe all summer long at this four-bedroom York cottage, a family-friendly Maine escape with a private patio, views of the ocean from upstairs, and an unbeatable location less than a block from Long Sands Beach! 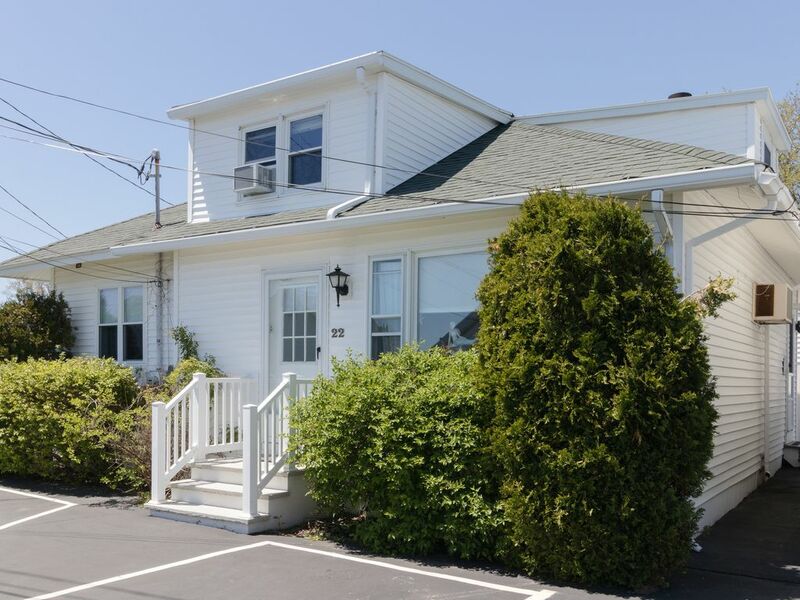 The perfect retreat for a family or a group of couples, this quaint, two-story cottage sits 50 feet from the open expanse of Long Sands Beach. Take sunrise walks along the shoreline toward the Nubble Light to the north, watch the boats come and go from York Harbor two miles south, and sample the darling eateries in the York Historic District one mile west. Greet the morning sun in the remodeled living space, where you'll find free WiFi, window-unit A/C (in the living room and three bedrooms), and a country kitchen with double ovens to assist with breakfast. Grab the beach chairs and a towel from the washer/dryer on your way out the door, and return home for lunch on the gas grill, a board game on the patio, and a movie or two on multiple TVs with cable, Netflix streaming, DVD/Blu-ray players, and a movie library. Come fall in love with the charms of Southern Maine! Parking Notes: Please park only two vehicles in front of the cottage. Any additional vehicles will be towed at your expense. The HOA has strict parking guidelines that must be followed. Actually the house was adequate but it advertised TVs in the rooms. Soooo. I assumed that the TVs worked in the rooms. We arrived and unloaded our things. We tried the tv in the kitchen. Didn’t work. We tried the tv in the master bedroom. Didn’t work. We tried the tv in the upstairs bedroom. Didn’t work. So I called the maintenance and they called me back and said no, those do not work and the only one that worked was in the living room. I would have never would have rented had I known that. Disappointed. Thank you for your feedback. We are currently in the process of removing the TVs in all but the living room and master bedroom. We do apologize for the inconvenience but appreciate that you reached out to us so our agents could refund for the loss of amenity. We hope to host you again! We were very close to the beach to go for a walk. We had a very fun weekend. I’m notsure I would enjoy the property as much if it were ‘in season’ as it was mid-January that was no problem (I just don’t enjoy the crowds) Everything as expected. We had a lovely long weekend and would return. We loved this cottage. The decor was well thought out. Loved all the little details. Colors and windows made it bright. The kitchen could use a better lighting system. Also the tv did not work. Great location. Otherwise we had a great time. We had such a great time at this rental this past weekend with friends! Everything we could have needed or wanted was right there in the home. Very inviting and comfortable. Best feature is the dining table that accommodates at least 10 comfortably! Love the open concept of the place and the fact that it was just like walking into a friend's home. Very cozy for an off season weekend getaway!